Plans to develop the old General Post Office will be proceeding now that the Office of the City Manager has received a report on the state of the building. City Manager Janice Braithwaite-Edwards told The Island Sun newspaper this week that her office can continue to consider plans for the use of the historic building: “We just got a report from Dr. Reginald Murphy out of Antigua on the structural element of the building. That is something that we have to look at before we can actually decide what we it is we are going to do,” she said. Meanwhile, the City Manager announced that the plans will include educational and cultural elements: “We also have in mind to create some kind of opportunity for students to be able to do research there. 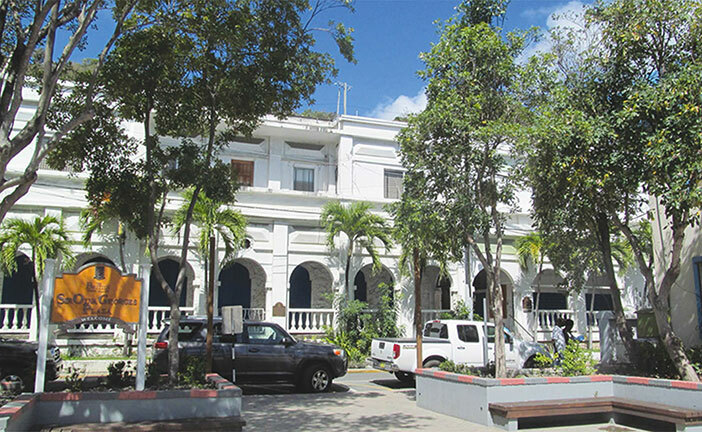 Out of that research will follow plays and dramatizations in the Sir Olva Georges Plaza coming out from the old post office; but first and foremost we need to make sure that the building is secure and that we don’t have any mishaps with the building,” she said. The plans for the old post office were revealed in 2014 in response to concerns that the relocation of the General Post Office resulted in a decline of the number of locals and tourists visiting that part of Main Street. At that time the City Manager was speaking on the 27 May edition of the JTV Spotlight program, to host Cromwell Smith. In recent years the Sir Olva Georges Plaza area suffered also because of the closure of the O’Neal Pharmacy, O’Neal Hardware Store, and relocation of Romney & Associates Headquarters, to name a few businesses that attracted lots of traffic.